RESULTS from the 2018 general election for the Garden Grove-Huntington Beach-Stanton-Westminster area. UPDATE (9:40 p.m.) – Dana Rohrabacher has regained the lead over Harley Rouda by a count of 84,863 to 84,836 in the 48th District, according to the OC Registrar of Voters. That’s based on 206 of 395 precincts counted. UPDATE: Harley Rouda has slipped into a narrow lead over Dana Rohrabacher in the 48th Congressional District race. According to the latest figures from the Orange County Registrar of Voters, the Democratic challenger is now polling 53,731 votes, to the Republican incumbents’ 53,482. The most-watched race in the Orange County area is looking like one of the closest ones as well, according to early returns Tuesday night from the Orange County Registrar of Voters. In the 48th Congressional District – centered on Huntington Beach – there’s a virtual deadlock between incumbent Republican Dana Rohrabacher and Democratic challengers Harley Rouda. Rohrabacher had 52,451 votes in the initial batch of votes to be reported, while Rouda had 52,370 – a difference of fewer than 100 votes. 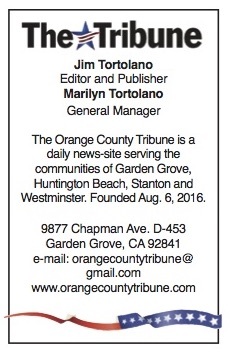 Also, Measure O – the 1 cent sales tax proposal – was being approved by Garden Grove voters by a margin of almost 2-1. The 48th District race was of nationwide interest as Democrats hoped to regain control of the House of Representatives. As of 9 p.m., national news agencies are reporting that has happened, with 239 Democratic Congressmen predicted compared to 206 for the G.O.P. Otherwise, it was a generally a good night for incumbents and familiar faces. In Congressional races, Democrat Lou Correa was off to a big lead over Republican opponent Russell Lambert in the 46th District, but John Briscoe (R) held an early and surprising lead over incumbent Alan Lowenthal (D) in the 47th District by a margin of about 100 votes. In the race for the 34th state Senate District, Janet Nguyen (R) was easily turning away the challenge from Tom Umberg (D) by about 13,000 votes. Westminster City Councilman Tyler Diep (R) grabbed a 7,000-vote lead over Josh Lowenthal (D) in the 72nd State Assembly race. For mayor: Incumbent Steve Jones has a wide lead over challenger Don Taylor. For city council: George Brietigam led in the District 1 race, followed by Gerry Serrano. In District 3, incumbent Thu-Ha Nguyen had a large initial lead over Duy Nguyen. In District 4, incumbent Phat Bui was handily outpacing Joe Dovinh and Mark Anthony Paredes. With four seats in contention, the early leaders were incumbents Mike Posey and Barbara Delgleize, then challenger Kim Carr, then Erik Peterson. In fifth place was incumbent William “Billy” O’Connell. For mayor, David Shawver has a huge early lead over Brian Donahue. For city council, Rigoberto Rodriguez was unchallenged in District 1 and in District 3, Gary Taylor had a majority of votes in a field of four. With two seats up for grabs, the top two were Tai Do and Chi “Charlie” Nguyen. Jamison Power and Anita Rice are third and fourth.